The 31st Annual South Padre Island Sandcastle Days attracted sculptors from all over the U.S. and abroad. 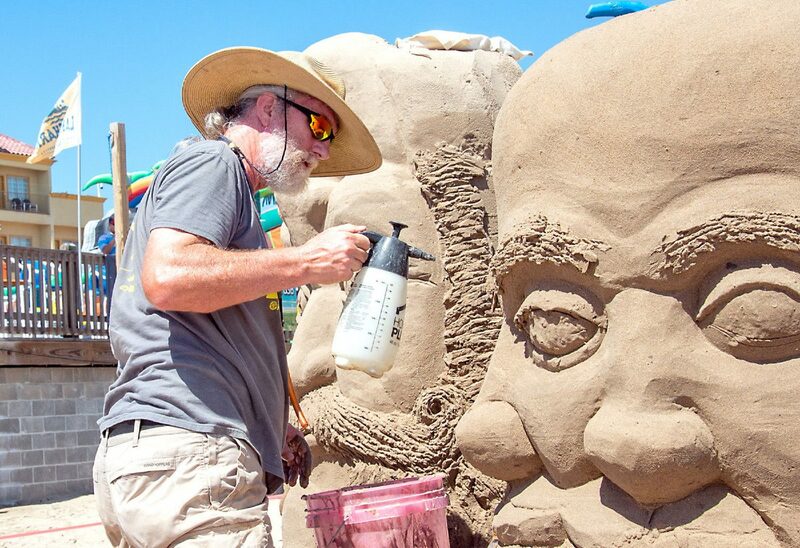 Bert Adams from Vancouver, Washington is shown working on some of the facial details of his sand sculpture yesterday. SOUTH PADRE ISLAND — As you’re walking along the beach this weekend, you might come across an array of sculptures in all different sizes created by people from the Unites States and other countries around the world such as Canada, Latvia and the Netherlands. Sand sculpturers Walter “Amazin’ Walter” McDonald and Lucinda “Sandy Feet” Wierenga created Sandcastle days 31 years ago to shine light on the sculpting features of the Island’s sand and to highlight the importance of protecting coastal shores. This year, 10 artists have been vigilantly designing, carving and chiseling buckets of sand into various sculptures, all in the hopes of winning this year’s “Masters of Sand” competition. Yesterday, while working on her piece, Wierenga said with each and every year, Sandcastle Days keeps getting bigger and better. 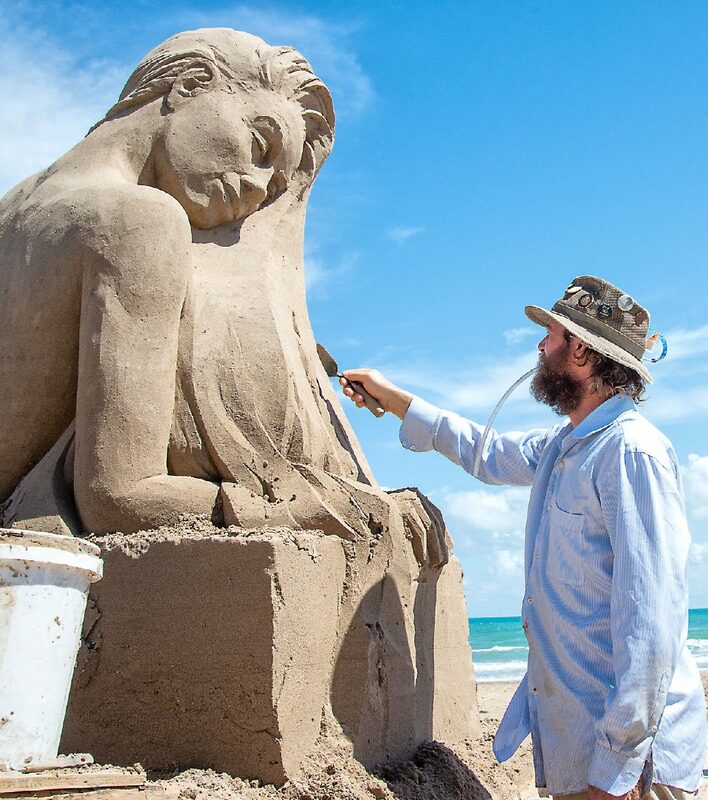 Abe Waterman smooths out the hair details on his sand sculpture. Waterman is from Canada and is participating in the 31st Annual South Padre Island Sandcastle Days taking place until Sunday at Claytons. For the past four days, she has been creating a sand sculpture with a subliminal message embedded into her massive six-foot tall creation. Harlingen residents, Richard and Rosie Loya have been visiting Sandcastle Days for the past 10 to 15 years. Yesterday, while on the beach, they said their favorite part about the event is being able to see the creative talent of people from around the world. Joris Kivits traveled from the Netherlands to participate in the “Masters of Sand” competition for the first time. When Kivits began creating his sculpture, he said he didn’t really have a plan or an idea of what he was going to make. For Kivits, sand sculptures are similar to a theater production. “ You can enjoy it as long as it’s there, and then the memory and pictures are all that remain,” he said. Today and tomorrow, sand sculptures will be offering free workshops to anyone who’s interested in creating their own masterpiece. Participants will be able to learn how to carve cat and baby sea turtle sculptures, learn how to use sand carving tools and will also be given a quick course in hand stacking.